I started wrapping packages for Carole this weekend. I dug out the curling ribbon and started to wrap. Immediately, I had a "helper". She hadn't been paying attention to me prior to my pulling out the ribbon but the second I started wrapping up the packages, she was there. She's not that into string and I don't let her play with my embroidery floss. She doesn't really chase shoelaces either. I tried that. She gets bored with those quickly. But that curling ribbon is like a magnet. And she chews on it. She chewed through one of the pieces which forced me to redo the bow and make sure she hadn't ingested any of it. 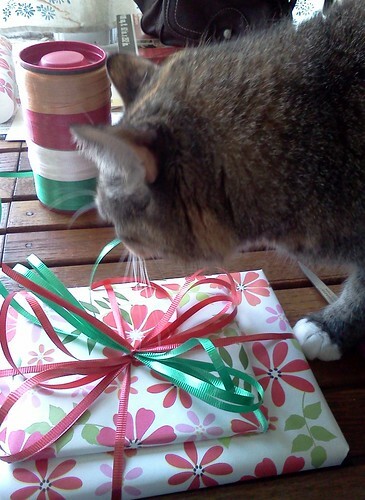 This curling ribbon is like tinsel to cats. Irresistible but it should not be consumed. So, here we head into the season of joy. Forget new toys. Joy, to Mija, is when mom gets out the curling ribbon.